Threads merged. Please remember the search function before creating new threads. No need to create separate threads when the artwork per country is identical. Hence two threads, not 3. 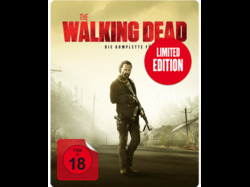 The steelbook is the one with Rick and the Red title on the Front, sorry @paulboland Entertainment One only provided 1 image with both steelbooks together. NEWS: The Standard Blu-ray & Steelbook WILL INCLUDE A BONUS DISC the BONUS DISC is a Blu-ray NOT A DVD and It is not a Jumbo!!!!!!!!!!!! !